One of the biggest mistakes that people make, is not protecting their eyes when tanning in a tanning bed, or even outside for that matter. I have to admit, that I am guilty of this myself. When I was younger, I used to laugh at the tan circles around people’s eyes from wearing eye protection in the tanning beds and outside, so I just thought closing my eyes was good enough. Now that I am a little older and a little wiser, I always wear eye protection in the tanning bed, and when i’m outside in the sun. They even have super skinny tanning goggles, to cover the least amount of your eye, while still protecting your eyes from the harmful UV light. Also, some tanning salons offer stickers, I believe these are called “Wink-ease”, that are specially made for your eyes. They kind of fold into a cone type shape and stick to your eyes, they work absolutely wonderful for showing no signs of white,”raccoon eyes”, they are sometimes called. If all fails and you still feel like you have white circles around your eyes, use some sort of bronzer or make up, even a face moisturizer with a touch of sunless tanner in it. Overexposure to UV light can cause great damage to your eyes if not protected,and believe it or not, just closing your eyes is not enough. Here are eight facts about using eye protection in a tanning bed, that you must read. Your eyes can get sun burnt! Tanning with no eye protection can cause red, itchy or watery eyes. These symptoms are all indications of short-term eye damage. You can damage your eyes in just one tanning session! Even just one tanning session, without protecting your eyes, can be enough exposure to cause you short-term eye damage. Photokeratitis (a temporary corneal burn which causes tearing, pain and blurring for several days). Closing your eyes is not protecting them! Your eyelids naturally block less than 25% of harmful UV rays from your eyes, and this will not protect you well enough. You may also be at risk from eye disease. Sharing eye protection is one of the main ways that eye infections such as conjunctivitis are spread. Eye protection that isn’t disposable is less hygienic and runs the risk of becoming contaminated. Repeated exposure to UV light without eye protection can also cause long-term and even permanent eye problems. Some damage caused to your eyes is irreversible! Long-term damage caused to your eyes include Diminished Color Perception (your sight will be dulled) and Reduced Night Vision. There is no cure for these. Long-term exposure to UV light without eye protection seriously increases your probability of developing a cataract. This causes severe pain and even blindness. Surgery is the only cure for cataracts. 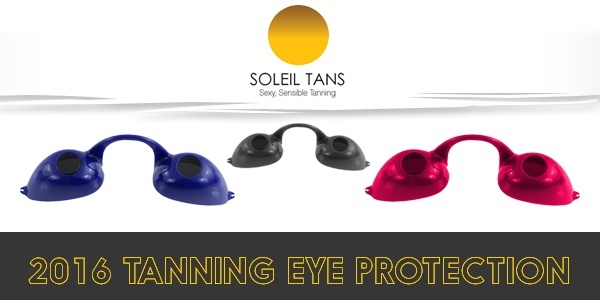 Wearing eye protection when you tan is one of the most important indoor tanning tips that there are. I hope this article convinces some of you to cover up those eyes. I know that when we’re young we don’t feel like we need to worry about things like this, but believe me, in a few short years you’ll be wishing you had done a few things differently, don’t make wearing eye protection while tanning one of them.